Ancient mourners may have left flowers on the grave of an Ice-Age woman known as the Red Lady of El Mirón, new research suggests. The woman, called the Red Lady because her body and bones had been smeared with a brilliant, sparkling pigment made from red ocher, lived about 18,700 years ago and was buried in a cave in what is now Spain. A large clump of pollen that was unearthed in the burial suggests people at the time placed flowers into the woman's grave, researchers said in a new study. The Ice Age burial was first discovered in 2010, when Lawrence Straus, an anthropologist at the University of New Mexico in Albuquerque, and Manuel González Morales of the University of Cantabria in Spain were excavating in a massive cave, known as El Mirón, occupied by prehistoric people in Cantabria. The team was digging around a large block that had likely fallen from the ceiling; the block was covered with engravings, including a triangular shape potentially representing a female pubic triangle. They soon noticed something tucked away in a nook behind the rock. It turned out to be the bones of an ancient woman, who died when she was about 35 to 40 years old. The skull was long gone, but about 100 bones, including the small bones of the fingers and hands, as well as the collarbone, shinbones and jaw, remained. 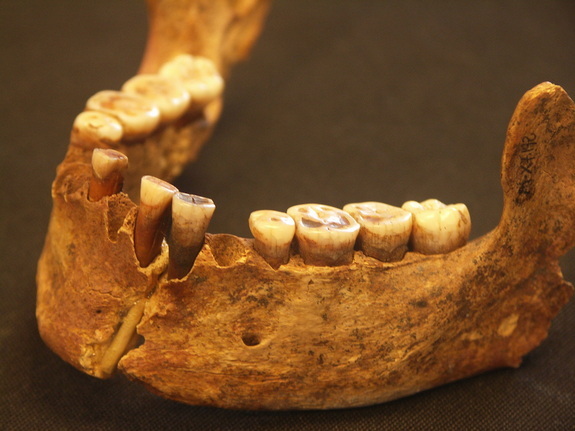 Similar to findings from other prehistoric burials — notably, the Red Lady of Paviland in Portugal — many of the bones were covered in a brilliant red pigment called ocher, and a leg bone also bore gnaw marks from a wolf that had likely dug up the skeleton after it was buried. The fact that some pigment was slathered on the bare bones (after the flesh had decayed) means that someone had reburied and redecorated the bones, Straus said. It's likely that the skull was deliberately removed from the burial, Straus said. "Maybe they had the cranium out on a stick in front of the cave, marking the spot: This is the cave of a wise women," Straus said. Carbon dating revealed that the ancient woman came from the Magdalenian culture during the last Ice Age. The ocher came from an outcropping at least 12 miles (20 kilometers) away, suggesting that whoever painted the bones must have gone out of his or her way to do so, Straus said. The type of ocher used "is filled with specular hematite, such that when you're digging, it sparkles at you," Straus told Live Science. "It's really quite a spectacular, bright, sort of purplish red and then millions of crystals." "She was, in death, presiding over her folks," Straus said. Now, María-Jose Iriarte-Chiapusso, an archaeobotanist at the University of the Basque Country, and her colleagues describe another stunning find in the cave: the presence of a large number of seeds from a weedy plant belonging to the chenopod family. This family of plants "can include small, yellow or yellowish flowers that are not showy by modern standards," the researchers wrote in the paper, which was published in May in a special issue of the Journal of Archaeological Science devoted to the Red Lady's grave. The pollen isn't prevalent anywhere else in the cave or near the grave site during this period, suggesting it was placed there deliberately, the researchers wrote. One possibility is that the pollen is the last trace of an ancient bouquet left to memorialize the woman, the researchers said in the study. Though the flowers wouldn't have been stunning by today's standards, during the cold, dry Ice Age, there wasn't much of a floral selection, the researchers added. This wouldn't be the only ancient example of a flower offering placed in a burial. At Raqefet Cave in Israel, hunter-gatherers laid the deceased to rest on a bed of sage and other aromatic plants about 14,000 years ago. And at Shanidar Cave in Iraq, flowers may have been offered at the grave of a Neanderthal woman who lived 60,000 years ago, though some researchers believe rodents, not humans, brought the pollen into the cave. The flower placement explanation is a resonable one, said Paul Bahn, an archaeologist who has visited the site but was not involved in the current study. "If you have Neanderthals doing that sort of thing then certainly you would have had people from the last Ice age doing it," Bahn told Live Science. However, there are other possible explanations for the pollen in the Red Lady's burial, Straus added. "The alternative explanation could be that the Red Lady had chenopod seeds in her stomach at the time of death," Straus said. "There are many chenopods in this vast family that have edible seeds." Editor's Note: This story was updated to note that Paul Bahn has visited the Red Lady's grave, but has never done excavations there.